Drive down any Massachusetts highway and you are bound to see hawks, falcons, and even an occasional owl or vulture perched on a tree branch or hovering on a telephone pole high above the cement. Rarely, do you get a glimpse of an entirely unexpected creature. But, as I was driving into the Boston last month, on a cold and snowy March afternoon, I looked up through my windshield to see the largest vulture I’ve ever seen, flying a mere twenty feet above my car over Route 2. Just then, the sun illuminated the bird’s face, and I realized I was mistaken. In actuality, it was a bald eagle. In seconds it was gone, flying away over Spy Pond in Arlington. For those who do not live near Boston, or even Massachusetts, this spotting may not seem like a big deal. However, the majority of people living in the state have never seen a bald eagle in the wild. The bald eagle’s population rapidly depleted during the 1950s through the 1970s as a result of the use of the toxic pesticide DDT on farms across the country. Mass Audubon details how DDT caused calcium deficiencies in bald eagle’s eggs. Instead of the eggshells protecting the young from their environment while growing, many times the chicks would be crushed by the weight of their nesting parents. Although DDT was banned across the country in 1972, most of the damage to the population was complete, and the bald eagle moved onto the endangered species list. More recently however, the bald eagle has been making its triumphant return around Massachusetts because of diligent conservation efforts. The U.S. Fish and Wildlife Service conducted an annual survey identifying only 5 breeding pairs of bald eagles in Massachusetts in 1990. By 2007, there were 25 pairs. Then, in January of this year, the Boston Globe reported that Mass. 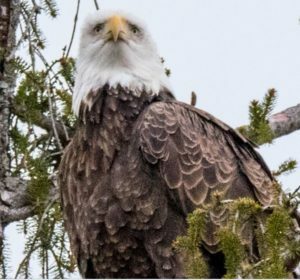 Wildlife had counted “68 nesting pairs this past year, a new record topping the previous year’s record of 59.” Thanks to regulations on pesticides, healthier water supplies in rivers and lakes, protected nesting areas, and a ban against killing eagles, these birds have made a rapid reintroduction into Massachusetts life. Although researchers believed bald eagles would be under distress living in or near the city, the birds seem to be proving otherwise. With the occasional bald eagle being spotted in Boston, the South Shore, and on the Charles River in surrounding suburban towns, we can start imagining a new life for these birds. It may not be necessary to visit a state park or the suburbs to find a bald eagle in the coming years. Maybe sooner than you expect, you may even see one of these majestic birds perched on a tree outside the T station in Cambridge. photograph of a bald eagle taken by Jon Jacobik, March 2018.